1. What qualifications do I need to enter an engineering master’s degree program? Students hoping to enter an engineering master’s degree program should already possess a bachelor’s degree in an engineering discipline or the equivalent. This includes 3 semesters of calculus, 2 semesters of calculus-based physics, statics, dynamics, etc. If you have a technology degree, it is most likely algebra-based and you will not be prepared for the rigors of a calculus-based engineering graduate program. If you have questions about your specific background, please contact the Director of Engineering Online at ldkrute@ncsu.edu. 2. How long does it take to complete an online master’s degree? Each degree program requires a minimum of 30 or 31 credit hours of coursework. A typical course is three credit hours. Students who are able to take classes full-time should easily be able to complete the requirements for their degrees within a two-year timeframe. However, students who are employed full-time are limited to six credit hours per semester. Additionally, not all required courses are offered every term. To determine exactly how long it will take you to complete your degree, you should review the requirements for your degree and consult your academic advisor to plan how and when you will fulfill those requirements. 3. Will I ever be required to come to NC State’s campus? Engineering Online students are never required to come to campus. Engineering Online provides true distance education classes and degree programs that require the same academic rigor and requirements as on-campus classes. Video lectures are available to students through streaming media or download. Homework is submitted electronically and exams are proctored locally. Students can contact their professors and teaching assistants through e-mail, course message boards or over the phone. 4. Can I enroll in a distance education course if I am currently enrolled as an on-campus student at NC State? In some cases, on-campus students can participate in Engineering Online’s distance education courses. However, on-campus engineering majors must receive written permission from the Director of Graduate Programs for their academic department to be enrolled in an Engineering Online class. Email is acceptable. Students who have permission to enroll must complete the Engineering Online registration form. You cannot register for Engineering Online courses through MyPack portal. 5. Can I take classes as a non-degree student before I commit to a master’s degree program? Engineering Online’s courses are open to non-degree students who meet the prerequisites for enrollment. Through non-degree studies, you can take a single course or a series of courses from our catalog of online courses without committing to a degree program. Engineering Online’s non-degree students enroll in the same courses as degree-seeking students and are held to the same high academic standards. If you take courses as a non-degree student and you are later admitted to a graduate degree program, you may be able to use credits earned as a non-degree student to fulfill degree requirements. Up to 12 hours of course credit taken as a non-degree student can be applied towards your degree, subject to the approval of the academic department to which you are admitted. 6. Can I get academic credit toward my master’s degree for my military or work experience, professional development courses, or by taking a standardized test? NC State does not allow graduate academic credit to be granted for work or life experience, non-credit courses, or standardized tests. 7. Who is my academic advisor? All Engineering Online students have access to an academic advisor. Non-degree students seeking guidance with academic issues can contact Engineering Online’s director. Degree-seeking students have an academic advisor within their academic department. Students who are unclear about the identity of their advisor should contact their academic department or the Engineering Online office for guidance. 8. Are Engineering Online’s master’s programs accredited, and what accreditation do these programs have? North Carolina State University is accredited by the Commission on Colleges of the Southern Association of Colleges and Schools (SACS) to award associate’s, bachelor’s, master’s and doctoral degrees. Undergraduate classes are accredited by ABET, the Accreditation Board for Engineering and Engineering Technology. 9. Does Engineering Online accept international students? Engineering Online strongly encourages qualified foreign nationals to apply for our programs. However, not all programs are available to individuals residing outside of the United States. Prospective degree-seeking international students should follow the application deadlines for international applicants indicated by their program, as well as English proficiency testing requirements established by the Graduate School. Additionally, international applicants must ensure that all supporting documentation, including transcripts and letters of recommendation, is in English. Prospective foreign national students must receive clearance from the Office of International Services (OIS) before enrolling in classes. Instructions for doing this will be provided as part of the admission process. 10. Who teaches online engineering and computer science courses? Engineering Online courses are taught by the same renowned NC State faculty that teach the College of Engineering’s on-campus courses. 11. Do Engineering Online’s master’s degree programs accept transfer credits from other institutions? In rare instances, students may be allowed to transfer credits from international institutions. 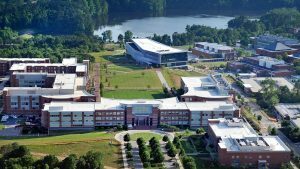 No more than 12 credit hours may be transferred from another institution into a master’s degree program at NC State. Transferring credits is dependent on both the academic department’s acknowledgment that the courses are relevant to the degree program and that department’s willingness to incorporate those credits into the student’s plan of work. The 12 credit hour limit applies to the combined number of hours from both transfer and NDS coursework. 12. When it is time for me to graduate, can I participate in the commencement ceremony? Engineering Online strongly encourages graduating students who are able to come to campus to participate in commencement ceremonies. Commencement ceremonies are held at the end of each Fall and Spring semester. Summer graduates may participate in the Fall ceremony. Both NC State and your academic department will host a commencement ceremony. Graduating students can choose to participate in either (or both) events. As graduation nears, the Graduate School provides all graduating Engineering Online students specific instructions regarding University commencement procedures. Students must review and follow these procedures to participate in the University commencement. Students planning to participate in the ceremony hosted by their academic department should contact their academic department’s graduate studies office for guidance. 13. What is a plan of work and how do I submit one? A plan of work (POW) is a list, by academic term, of the coursework a student must complete to earn a degree. All graduate students are required to complete a POW. Students develop their plan of work using both departmental degree requirements and guidance from their academic advisor, and enter the POW online via the Student Self Service section of MyPack portal. Students may begin composing their POW as soon as they enroll in their graduate degree program. The POW must be approved by the academic department, and submitted to the Graduate School for final approval. No student is permitted to graduate without an approved POW on file in the Graduate School. 14. What is the deadline to submit my plan of work? Ideally, your POW should be submitted in MyPack and approved by your academic department before the end of your second semester of coursework. However, students attending part-time may need more time to develop an accurate POW. All students should submit a POW no later than the start of the semester in which they plan to graduate. This ensures that the Graduate School will have time to review the POW for final approval prior to graduation. Be aware that the Graduate School will not approve your POW without a signed Patent Agreement on file. No student is permitted to graduate without an approved POW on file in the Graduate School. 15. How will I receive my diploma when I graduate? The Office of Registration and Records mails diplomas to graduating students approximately one month after commencement. Diplomas are sent to the home mailing address each student has on file in MyPack portal. To receive their diplomas, graduating students must review their contact information in the portal and make any necessary changes prior to commencement. The process that you use to apply for admission depends on whether you plan to be a degree or non-degree seeking student. Applicants for Engineering Online’s master’s degree programs go through the same admissions process as all other prospective NC State graduate students. Apply now through our convenient online admission application. Remember as you are completing the admissions application to select the distance option for the program in which you wish to enroll. For example, to apply for the distance Aerospace Engineering master’s program, choose “Aerospace Engineering – Distance Track – MS,” not “Aerospace Engineering – MS” as your desired program in the drop-down menu of the application. This is crucial for avoiding administrative issues later on. Once you have received admission to an Engineering Online master’s degree program, you can use Engineering Online’s registration process to enroll in your desired courses. Non-degree students can simply complete Engineering Online’s registration request form. After Engineering Online’s registrar has reviewed your form, you will be instructed to complete the application to enroll at NC State University as a non-degree studies student.